With over 30 years of experience in the oak frame industry Our M.D has worked hard to create a range of Garage and Outdoor Living buildings that are not only practical and functional but that are aesthically complimentary to their surroundings as well as being eco friendly. 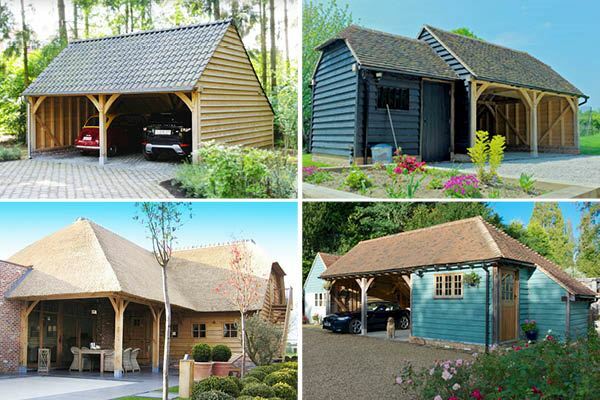 Our Acorn range of garages has over 480 design variations and if you can't find a building to suit your needs then we offer a bespoke design service. Our Supply & Build service is a complete service from beginning to end, inclusive of all groundworks prior to the delivery of your building, the assembly of the Oak frame and hanging of doors (if required) and tiling of the roof once the frame is complete. Our quality, service, expert technical advice and backup are what we strive to achieve so that our clients have a building supplied by Oak Designs that not only enhances their surroundings but adds value and leaves an enduring legacy of a great British building. If you have employed a local building contractor to carry out groundworks, Oak Designs will then Supply & Assemble the frame. We will manufacture the oak components exactly to the agreed design specification (designed by us) and we will deliver them to your site at an agreed time usually just after your groundworks have been completed. Our team will then erect the oak frame building on this pre-built base. Once the oak frame work is complete the customer will arrange for the roof tiling to be done and any other modifications they desire. Depending on the location Oak Designs can supply ground works aswell as roofing to find out further details regarding this please contact the office on 01273 400411. 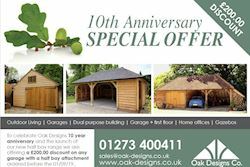 Oak Designs have over 480 designs in our Acorn Garaging Range as well as our 16 standard designs in our Outdoor Living buildings. These standard building designs can be produced quickly and efficiently in our workshops using a blend of traditional carpentry skills with some help from modern technology. We can usually produce an entire building within 6 weeks from the date of order confirmation. Once your order has been confirmed and a deposit paid we will manufacture all components in our workshops which will then be dismantled and supplied to you in kit form. They will then be delivered to you as a kit with numbered parts, working drawings and stainless steel pins and oak pegs. We can design buildings to suit our clients whether they submit their own Architectural plans or our Surveyors, can interpret our clients’ ideas to design an oak frame building best suited to their vision and their property. 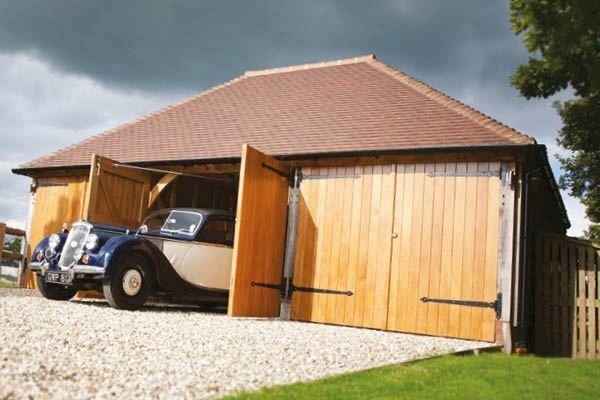 All of our Acorn Garaging and Outdoor Living range can be customised to suit our clients’ individual requirements. 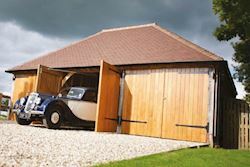 Our garaging buildings can also be designed to suit habitable standards. Please ensure that you advise us so we can design to your specific requirements. Oak Designs are one step ahead of the competition when it come to a personal and professional service. You will be visited by a qualified and experienced surveyor who can advise you on all aspects of your intended development to ensure you have the best chance of achieving planning permission (if required) and that you get the very best from the space you have available. Please call our sales team to book an appointment or use our online request form on our 'Contact' page. Please note, free site visits are subject to your location for further information please get in touch with us. Following on from a site visit, our in-house CAD department can design and create your bespoke design using 3D modelling software to help achieve the best design for you. We only use green oak sourced from recognised sustainable F.S.C. and P.E.F.C. certified forests. Green oak has the lowest embodied energy of any primary building material. Materials used in green building are eco-friendly and help lessen the impact of the building on the surrounding environment. 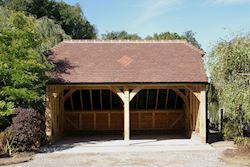 Compared with traditional brick buildings, oak framed structures are ‘dry build’ thereby saving on gallons of water normally used on a building site. They are considerably quicker to construct on site which means they are also more cost effective. When using ‘green’ unseasoned oak the timber contracts, tightening the joints to give a superbly strong structure which will endure and be admired for many years to come. All our buildings are dry fitted by our skilled team of carpenters prior to being delivered allowing a final quality control check. Quality and service is paramount to us and we always strive to exceed our clients expectations. Please visit our website for further information on what we can do alternatively give the office a call to speak one of our team on 01273 400411. We now have design a tool on our website called “ Quote My Design” where you can design your own garage online and apply for a full quote.